Until recent years, the gold standard treatment for all renal tumors was radical nephrectomy. , Partial nephrectomy (nephron sparing) was introduced as a feasible alternative to radical nephrectomy in the last few decades for small, localized renal tumors ≤4 cm in diameter. Initial indications were limited to bilateral tumors, solitary kidney, pre-existing chronic kidney disease, and co-morbid diseases, threatening renal function. In late 1990s, these indications were broadened to include elective settings in patients with completely normal contralateral kidney which offers a rather unique benefit of preserving better long-term renal function and simultaneously reducing over treatment of benign or clinically indolent tumors. Thus, nephron sparing surgery (NSS) has become a standard method of treatment in patients with normal contralateral kidney. ,,, This retrospective study was conducted to evaluate our experience in open NSS conducted at the Prince Hussein Urology Center, Jordanian Royal Medical Services, Amman, Jordan. During the period between January 2001 and January 2008, 52 patients underwent partial nephrectomy at our center. All the patients were referred to our center with a diagnosis of renal cell tumor and were evaluated fully for possible nephrectomy. The investigations performed included kidney function tests, liver function tests, complete blood count, urine analysis and culture, chest X-ray (CxR), liver ultrasound, renal CT scan with intravenous (i.v.) contrast or renal MRI, in patients with renal impairment. In symptomatic patients, brain CT scan and/or bone isotope scan were performed. The patients were staged according to the TNM staging system, 2002 [Table 1]. 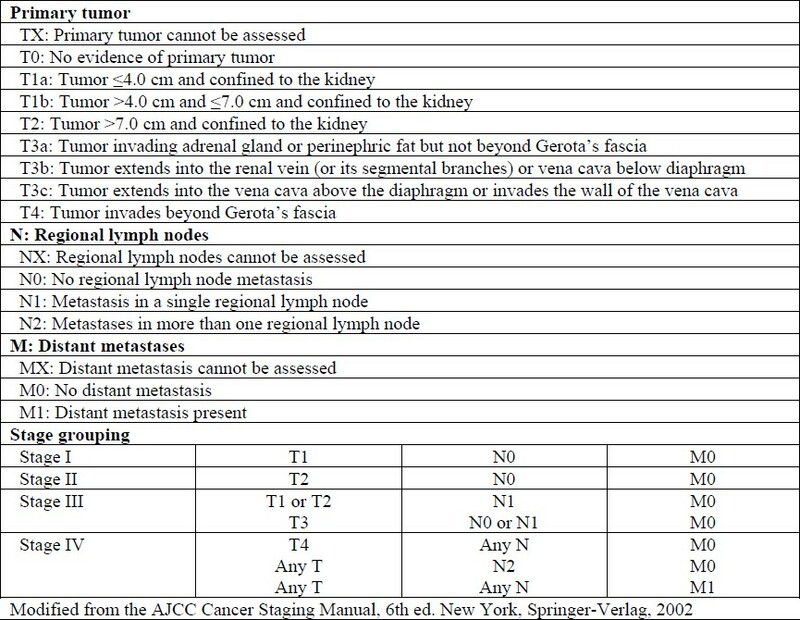 Table 1: TNM classification of renal cell carcinoma. Indications for partial nephrectomy are mentioned in [Table 2]. The procedure was fully explained to the patients and their consent was obtained. All the patients were treated with a lateral retroperitoneal approach and the incision was made above the 11 th or 12 th rib toward the umbilicus. The patients were hydrated well after surgery and treated with appropriate antibiotics and kept in the hospital until the drain was removed safely. Bed rest was advised for two weeks. Table 2: Indications for partial nephrectomy in the study patients. The patients were seen in the clinic four weeks postoperatively and assessed clinically and with laboratory tests. Three months after surgery, a CT scan was performed to identify the kidney morphology for future reference. Regular follow-up was performed every six months for two years and yearly thereafter. During each visit, kidney function tests, urine analysis, CxR and renal ultrasound were performed on all the patients. The histopathology results and the safety margins were reviewed and analyzed. The data collected were analyzed for the kidney functions, complications and recurrence. There were 33 males (63.5%) and 19 females (36.5%) in the study with a mean age of 54.3 years (range 19-75 years). In 23 patients (44.2%), the lesion was discovered incidentally during routine investigations. Details of the tests done initially are given in [Table 3]. 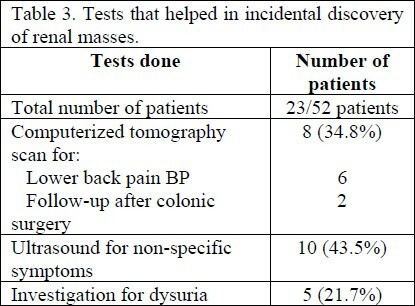 Table 3: Tests that helped in incidental discovery of renal masses. All tumors were small, with the average size being 2.9 cm (range 2.1-4.0 cm). Three patients had tumors of size about 7 cm; all were exophytic tumors in favorable position in the lower pole. The location of the tumor was in the upper pole in 28 cases (53.9%), it was centrally located in nine cases (17.3%) and it was in the lower pole in 15 cases (28.8%). Histopathology revealed that 49 tumors (94.2%) were T1a and three (5.8%) were T1b. The histopathology subtypes were clear cell renal cell carcinoma in 42/52 cases (80.8%), papillary cell carcinoma in 8/52 cases (15.4%), collecting duct tumor and chromophobic renal cell carcinoma in one case (1.9%) each. All tumors had a safety margin of a minimum of 3 mm, with an average of 5 mm (range 3-6 mm). The average hospital stay was eight days (range 5-27 days) and the average follow-up duration was 62 months (14-96 months). The indications for NSS in patients with renal cell carcinoma are rapidly expanding. The standard indications include three categories: absolute, relative and elective. The absolute indications are when radical nephrectomy will render the patient completely anephric with an immediate need for dialysis. These include bilateral tumors or tumors in solitary kidney. In these cases, the preservation of the most functioning parenchyma should be the goal. Relative indications include a unilateral tumor with normal function of the other kidney, but with a condition threatening its future function, such as calculus disease, chronic pyelonephritis, renal artery stenosis, vesicoureteral reflux or a systemic disease such as diabetes or nephrosclerosis. It also includes patients with hereditary form of renal cell carcinoma where there is a higher risk of future tumors. Elective indication includes patients with small localized tumors of ≤4 cm in a normal contralateral kidney. Long-term follow-up in our study patients showed that partial nephrectomy is an excellent procedure for small tumors, with good preservation of renal function, low incidence of chronic renal failure in the future, lesser need for dialysis, and low recurrence rate. We conclude that NSS is an effective method of treatment in patients with T1 renal cell carcinoma, which results in an excellent outcome, low morbidity with adequate preservation of renal function and an excellent survival rate and performance. Furthermore, the use of advanced radiological imaging techniques helps in detecting incidental renal masses at an early stage, thus increasing the utilization of nephron sparing surgeries, which in turn helps in improving the overall outcome. 1. Heldwein F, McCullough T, Souto C, Galiano M, Barret E. Localized renal cell carcinoma management: an update. Int Braz J Urol 2008; 34(6):676-90. 2. Parkin DM, Whelan SL, Ferlay J, Raymond L, Young J. Cancer incidence in five continents v.7. Lyon: International Agency For Research on Cancer; 1997. 3. Taneja M, Tan KT. Renal vascular injuries following nephron-sparing surgery and their endovascular management. Singapore Med J 2008;49(1):63. 4. Kirkali Z, Canda E. Open partial nephrectomy in the management of small renal masses. Adv Urol 2008;10:1-7. 5. Novick AC. Laparoscopic and partial nephrectomy. Clin Cancer Res 2004;10:6322-7. 6. Dighe M, Takayama T, Bush W. Preoperative Planning for renal cell carcinoma- benefit of 64- slice CT imaging. Int Braz J Urol 2007; 33(3):305-12. 7. Smith D: Renal Cancer. Urology 2002;20:301-4. 8. Hafron J, Kaouk J. Cryosurgical ablation of renal cell carcinoma. Cancer Control 2007;14 (3):211-7. 9. Rubienstein M, Moinzadeh A, Colombo J, Favorito L, Sampaio F, Gill I. Energy source for laparoscopic partial nephrectomy - critical appraisal. Int Braz J Urol 2007;33(1):3-10. 10. Perry K, Zisman A, Pantuck A, Janzen N, Schulam P, Belldegrun A. laparoscopic and percutaneous ablative techniques in the treatment of renal cell carcinoma. Rev Urol 2002;4 (3):103-11. 11. Sheth S, Scatarige J, Horton K, Corl F, Fishman E. Current concepts in the diagnosis and management of renal cell carcinoma: role of multidetector CT and three-dimensional CT. Radiographics 2001;21:S237-54. 12. Tsui K, Ophoven A, Shvarts O, Belldegrun A. Nephron-sparing surgery for renal cell carcinoms. Rev Urol 1999;1(4):216-25. 13. Lee M, Oh Y, Han W, et al. CT findings after nephron-sparing surgery of renal tumors. AJR Am J Roentgenol 2007;189(5):264-71. 14. Bhayani S, Das N. Robotic assisted laparoscopic partial nephrectomy for suspected renal cell carcinoma: retrospective review of surgical outcomes of 35 cases. BMC Surg 2008;8:16. 15. LI Q, Guan H, Wang F, Jiang T, Wu H, Song X. Significance of margin in nephron sparing surgery for renal cell carcinoma of 4 cm or less. Chin Med J 2008;121(17):1662-5. 16. Israel G, Hecht E, Bosniak M. CT and MR imaging of complications of partial nephrectomy. Radiographics 2006;26:1419-29.